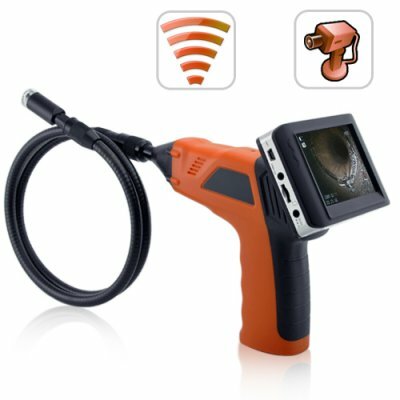 Successfully Added Wireless Inspection Camera with 3.5 Inch Color Monitor + DVR to your Shopping Cart. Featuring two super bright LED lights for use in dark locations, and a 38 inch flexible shaft, this lightweight hand-held inspection camera helps you find, diagnose and solve problems quickly and without expensive demolition or disassembly. The DV34 comes with a removable color LCD monitor that displays crystal clear video for accurate visual inspection. In addition, the monitor has a DVR function to record and save your video via Micro SD card. This is the best way to present problems to your client when looking to receive an authorization for repair or replacement. When you can assess a project without having to do unnecessary damage, you save yourself time, effort, and money. Purchase the DV34 today as the perfect addition to your tool set, or purchase this product in bulk and make a great profit for your retail store or online business. The DV34 is in stock and ready for immediate shipment, brought to you by the leaders in wholesale electronics, Chinavasion! Sending was delivered in time by Hongkong Air Mail service. No damages,in good condition. Thanks to team of Chinavasion.